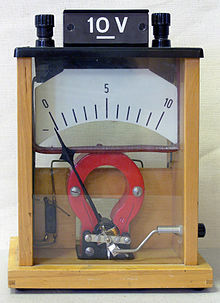 Moving coil meter only measures direct current. It has a linear scale because the pointer deflection is directly proportional to the size of the current. 1. With the switch open, there is no current flow through the meter coil. 2. With no current flowing, the coil generates no magnetic field and the pointer stays at zero reading. 3. Close the switch and a current flows through the coil. 4. The current creates a catapult magnetic field and a turning force acts on the coil. 5. The turning force rotates the coil and the pointer deflects across the scale until the hairspring produces an equal and opposing turning force on the coil. As the current through the coil increases, the magnetic field generated around the coil increases. 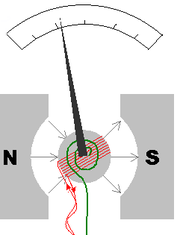 The stronger the magnetic field, the larger the turning force of the coil to move the pointer. With the use of hairsprings, the coil will return to its initial position when there is no current. The springs will also tend to resist the movement of the coil when there is current through the coil. When the attraction between the magnetic fields (from the permanent magnet and the coil) is exactly equal to the force of the hairsprings, the coil will stop moving toward the magnet. Other features are used to increase the accuracy and sensitivity of this meter movement such as. An iron core is placed inside the coil to concentrate the magnetic fields. Curved pole pieces are attached to the magnet to produce a radial magnetic field to ensure that the turning force on the coil increases steadily as the current increases. Increasing the area of the coil. Wow. You are an amazing physics teacher. Understood this in two minutes. Thanks a lot!